Whether you’re hosting a small weekend get-together, a large gathering, or anything in between, entertaining friends and family always provides an opportunity to create memories that last a lifetime. No host wants to miss the highlights because of an endless to-do list in the kitchen, but with the right recipes and refreshments, it’s easy to throw a successful, enjoyable dinner party for you and your guests. Courtesy www.EdnaValleyVineyard.com. Prepare pasta according to package instructions until al dente. Toss with 1 tbsp. olive oil to prevent sticking and allow to cool. 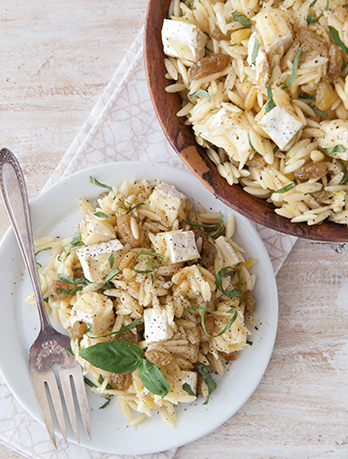 In large bowl, toss pasta with remaining olive oil, lemon zest, lemon juice, garlic, Brie cubes, raisins, pine nuts, and basil. Season with salt and freshly ground black pepper, to taste. Garnish with additional basil, if desired. For salad: Cut bread into 1-inch thick slices. Brush both sides with olive oil and season with salt. Grill bread on both sides until toasted and grill marks are present. When bread is cool enough to handle, rub garlic clove on both sides. Cut into 1-inch cubes. 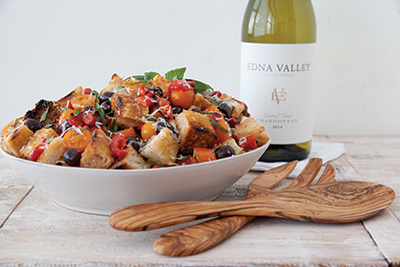 In large bowl, combine bread, peppers, tomatoes, olives, basil and cheese. For balsamic vinaigrette: In small bowl, combine balsamic vinegar and garlic. Whisk in olive oil in slow stream until combined. Season with salt and pepper, to taste. Toss vinaigrette with salad and serve immediately. Garnish with additional fresh basil and grated cheese, if desired. Heat oven to 400 F°. In cast iron skillet, toss tomatoes with pinch of pepper, kosher salt, and light drizzle of olive oil and place in oven. Roast tomatoes for 20 minutes. Set aside. Heat skillet on stovetop. Once hot, sear chicken thighs. Flip chicken and sear bottom side for about 1 minute. Remove chicken from pan and set aside. With pan still hot, pour in white wine. Once wine has settled, add minced garlic. Add juice of one lemon. 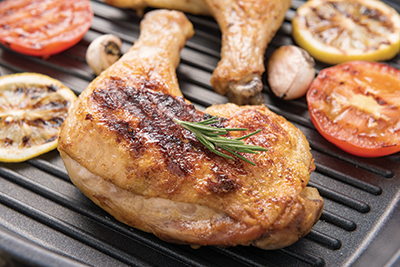 Return chicken thighs and tomatoes to skillet. Bake for 35-40 minutes.